from my window. Can you see the balloons? I am in the middle of a bunch of things- just stopped to check blogs, quickly. I saw that you updated, clicked on and read your caption(quickly, quickly). the l and the o in "baloons" melded together as I scanned and I thought Baboons! BABOONS!!! oh, my...so I decided to take ten minutes to read. my break. and enjoy the photos. This looks like cotton candy! 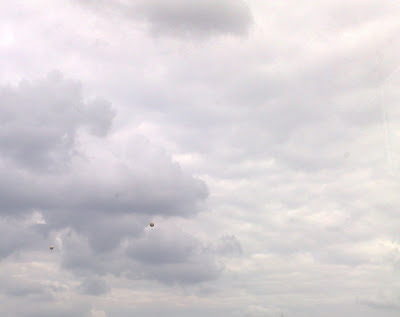 We have big balloons on the sky often too (there is a little airfield near by). Does Frodo like them? Our older dog got scared of one once, and doesn't like them at all..
this is so beautiful. there's something about your sky photos that always get to me, Andrea! up, up and away!- i´m glad i found your blog!